Sometimes when I am out shopping at thrift stores I spot an item that I think is kind of cool but I have no idea what I'd use it for. More often than not I buy it anyway. That was the case with this cute vintage spice rack that was made in Japan. It has been three years less one month since I first posted this thrifty find here on the blog. Back then, readers suggested I use it for storing toiletries in the bathroom. 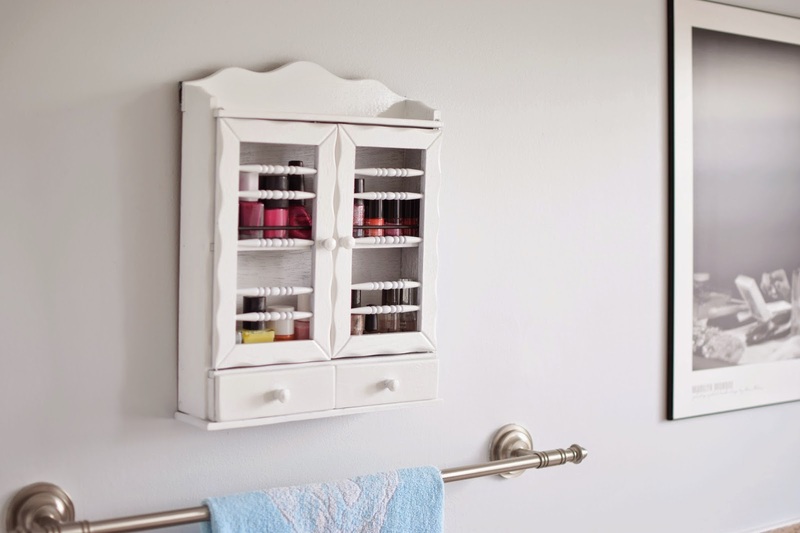 It's a bit smaller than the photo might suggest, but their idea got me thinking about using it as a nail polish cabinet in the master bathroom, thus getting all the nail polish out of my bathroom drawer. Fast forward three years and I finally have this little baby painted and on display! Am I the worst procrastinator ever? Long delay aside, I am pleased with the end result. I believe that having some vintage and thrifted pieces in your home gives it extra character. Sure I could buy a brand new, ready-to-go cabinet, but it wouldn't have that quirky look and personal touch that makes this little cabinet special. And often it's more affordable to buy a thrift store or flea market piece to make over than it is to buy brand new. 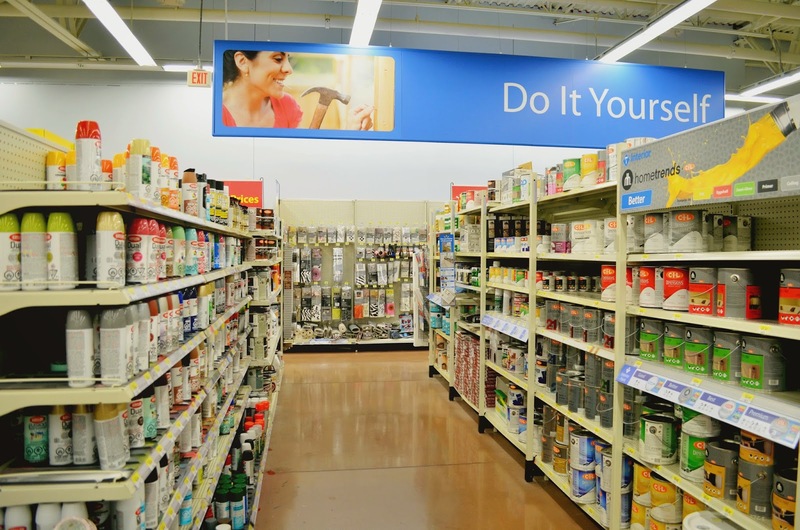 I bought the primer and paint at Walmart in the "Do It Yourself" section. 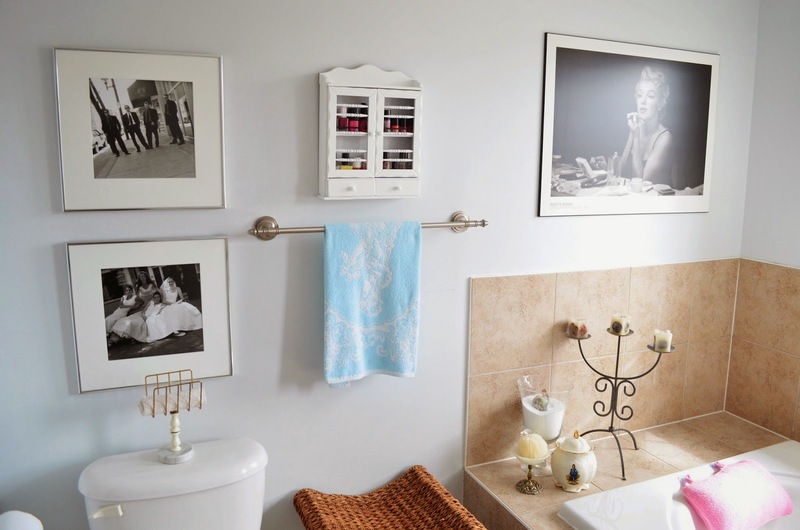 I thought about painting the cabinet a fun colour like sea blue or pink, but I share the bathroom with my husband and he was more comfortable with simple white. 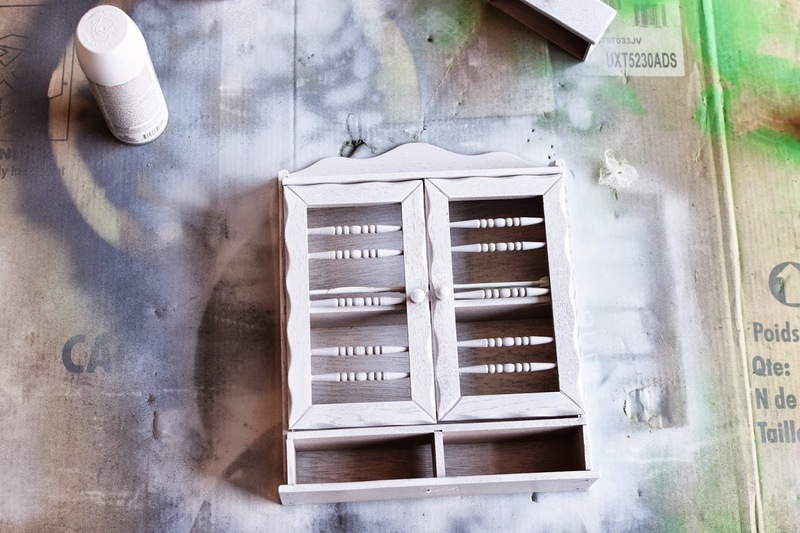 I wanted spray paint because of its ease of use in tight areas (like the little drawers) and for covering the carved areas of the cabinet. 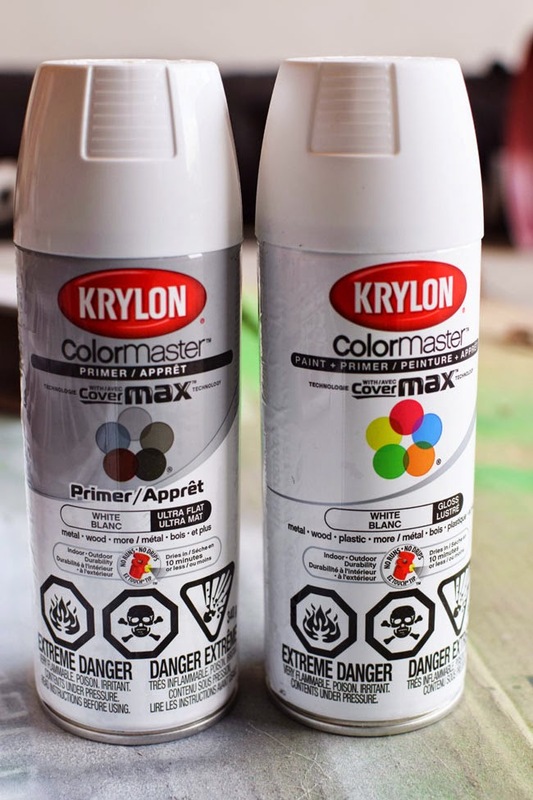 I chose whatever white paint was easily available in the store - it was Krylon ColorMaster at Walmart. I started off by lightly sanding the spice rack. The door wasn't supposed to come off during the process, but I suppose my "light" sanding needed to be even lighter, because the door fell off and I had to glue a small crack in the cabinet. I then taped off areas that I didn't want to paint, like the door latch and the metal rods. It was still cold outside, so I put the cabinet in the garage. I would not work in the house, as this primer and paint both have very strong odours. I used two coats of primer, allowing it to dry for a couple of hours after the first coat. My husband and I then took turns painting. Basically we put a coat on anytime we went near the garage. I discovered that we have very different painting styles. He puts the lightest mist of paint on because he doesn't want it to drip. I, on the other hand, blast it on because I don't want to wait. We put on several coats over three days before the wood grain was covered. 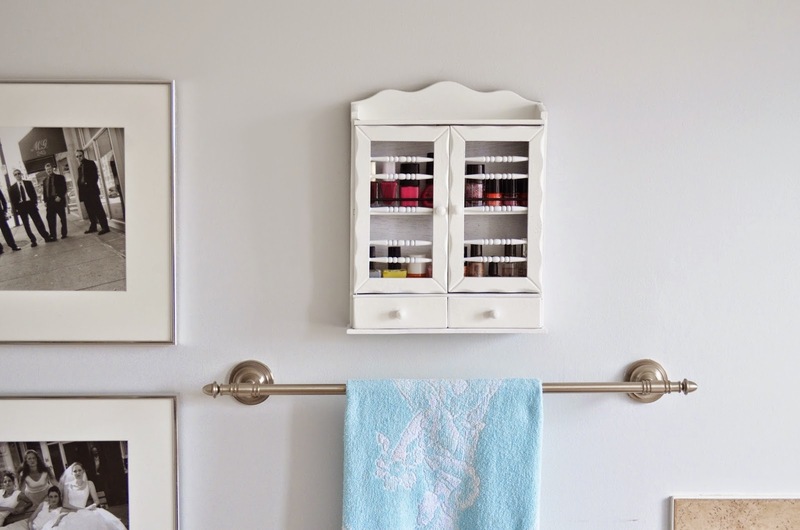 And then it was finally time to hang my little nail polish cabinet on the wall. It turned out to be just the right size for me - it holds 18 nail polish bottles, which is just about how many I have. How many I actually use is another story! We chose to let some of the wood grain show through on the interior of the cabinet to add a bit of texture. But now I'm considering painting the interior a fun colour or lining it with a colourful paper. I'll get back to you in another three years! 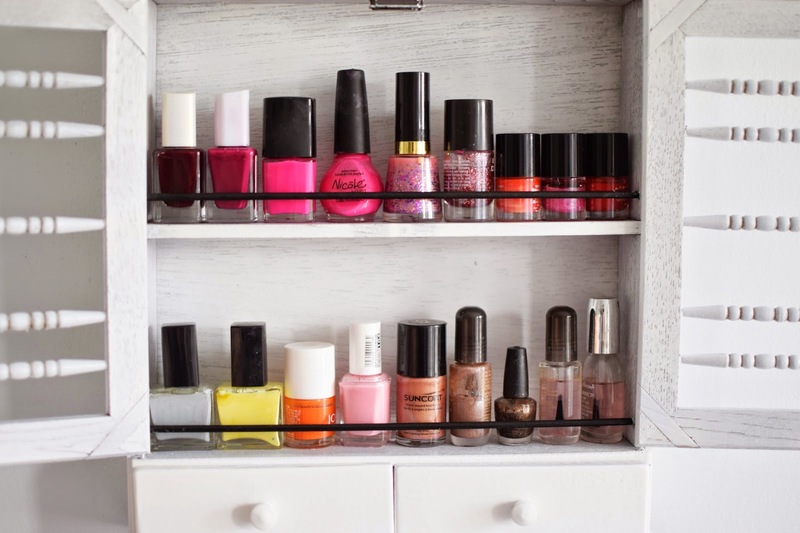 The two little drawers are perfect for holding nail cutters and emery boards. To give you a better idea of the size of the cabinet, here's a look at the full wall. I think it fills in the small gap above the towel rack nicely. 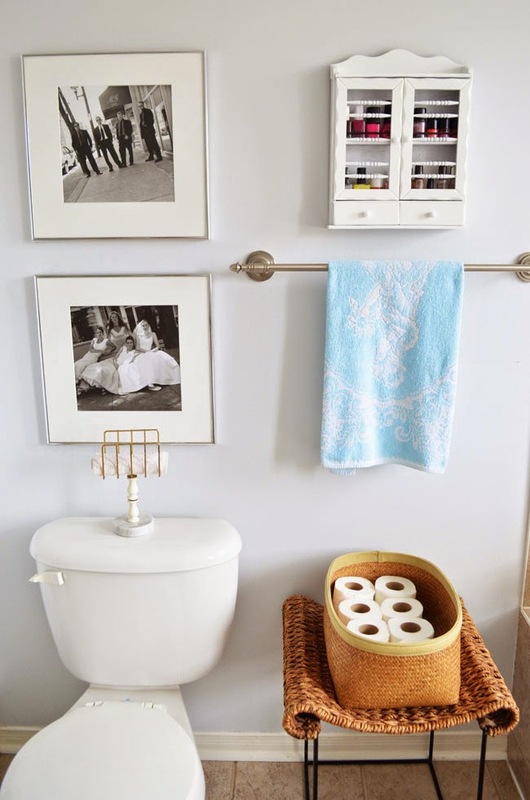 As spring is the perfect time to renew, refresh and organize your home, this was a great easy project to do a bit of all three. 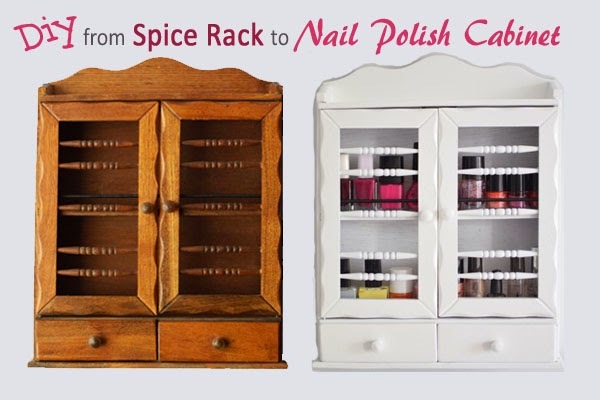 Keep in mind that if you make your own diy nail polish cabinet you are entitled to go out and buy new nail polish too! Because I said so. 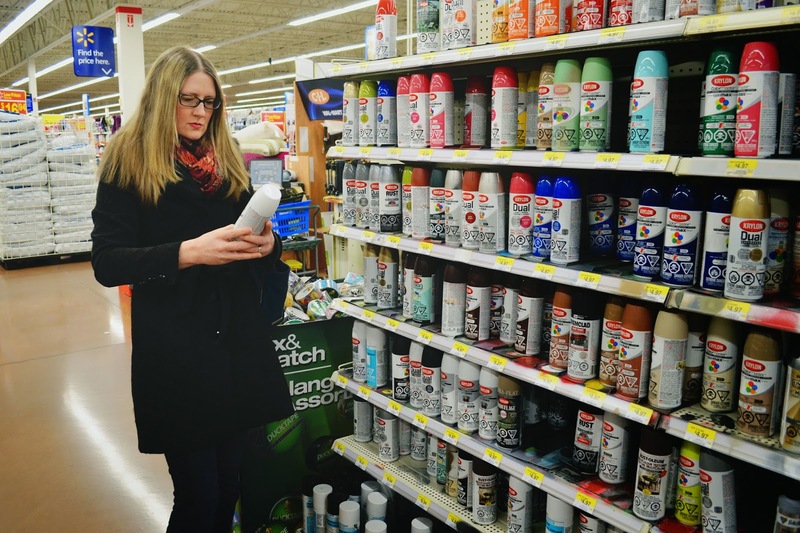 Are you ready to head out and find a cool thrifty item of your own to make over for your home? How cute!! I love refinishing found pieces! You are a crafty genius! You are so thrifty and talented all at once - love it! I love how you can see past the original object. Aw, you are so sweet! I get a lot of ideas from the great comments that people put on my thrifty finds posts. That's really great and the size is just right for where you placed it (and I also have thrifty finds from three years ago that I haven't done anything with)! I have so many nail polishes that are currently stored in one of those toiletries bags you get on long haul flights, making it a pain to find one particular colour. I don't use them as much as I should though, I love putting on a colour but when it chips and goes yuck I can't always be bothered removing it, or I just forget! Thanks! I'm glad to know you hang onto stuff that long too! :) I almost never put polish on my hands because it gets chipped in an hour. I think I put it on my toes about 3 times per year! Thanks! I know how easily it can happen...a colour here, a colour there and suddenly you have a ton of nail polish! Thanks so much! How nice!! What a cute bathroom you have! Great idea!